Carroll, we need some updates for the conference in Orlando. The conference is off and running! Congratulations and tons of success to Florida LEGAL! I just got back last night from the Sixteenth Annual Conference and it was a complete and total successs !!! We had great workshops and seminars and Gay Days was just out of this world. I'll try to move some photos over from Facebook so you can see how good we looked in uniform. Stuart Milk, Harvey Milks nephew, gave the keynote address at the closing banquet. Amsterdam and Canada sent full delegations. I am so happy that I am stepping down from office at the end of this month. It's time to let somebody else worry about this. Next year, I will do nothing in planning the conference. I'll just go and hang out at the bar !!! If anyone would like to share conference pictures. Please email them to me. Thanks, so much. BUT... next year, I'll be the one with the big grin on his muzzle, wagging his handsome furry tail (such tail as bears have, ) and happily buy Carroll a drink in the bar! I note from Carroll's message that Canada and Amsterdam sent full representative groups! THREE CHEERS! I believe next year's Conference is in Amsterdam West (San Francisco, heehee,) and, after that, Toronto. Not sure which year but the actual Amsterdam is in the mix somewhere too! If I don't succumb to total lunacy by signing the application to go for my PhD., I'll be seeing all you men and women in blue every year from now on! I'm looking forward to the pics from Orlando! I knew it was going to be a success! Now, let's see some photos! Just wanted to let you guys know that, due to administrative problems, the seventeenth International Conference Of LGBT Criminal Justice professionals has been posponed. Legal International is looking forward to working with Toronto and Amsterdam as they put together the next conferences. More info to follow. This is Lost Wages in September? Not Really !! When we begin the work of putting a conference together, we rely on volunteers from each chapter to get things done. For example, we need a committee for finding the speakers, for arranging for the social events, for catering, for accomodating VIP's, for putting the conference book together, for finding advertisers, for fund raising and a wide variety of other things. Every year, it has become harder and harder to get people to step up and do this work. Often,(with the exception of individual chapters) most of the work of putting the Legal International conference together has fallen on my shoulders. Last year, I made it known that I would not be available to work on the seventeenth conference because of other obligations. George has worked hard trying to find people to take up the slack and put the conference together but to no avail. Everyone wants the conference to take place but nobody wants to do the work to make it happen. There are lots of talented people in Toronto and Amsterdam who are excited about hosting the next conferences. The Legal International conferences are only as good as LGBT criminal justice professionals make them. We don't just want you to come to the conferences (even though many of you never do) we need your participation in the planning as well. Far to often I'm forced to listen to guys who want to tell me what we could do, what we should do, and what we fail to do in planning the conference. Meanwhile they give us no real support while they sit on their hands and flap their lips. Legal International is alive and thriving. 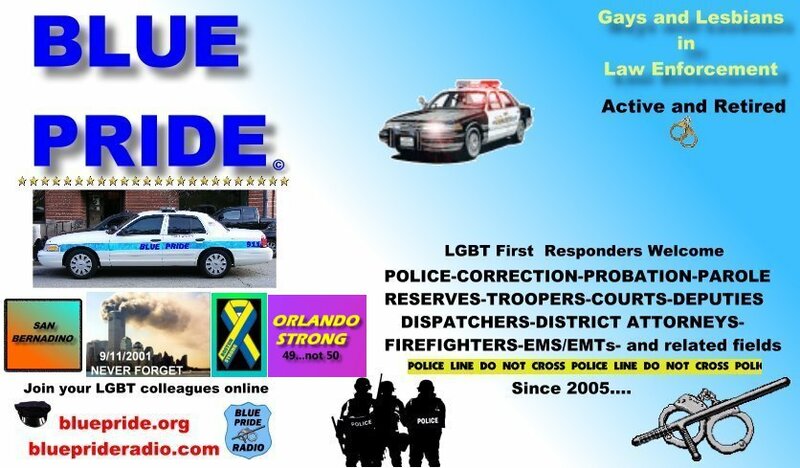 We will continue to work with chapters here and abroad who care enough about the LGBT Law Enforcement communtiy to continue our proud traditions. Well I am a sucker for volunteering, but having never been at one, you'd all learn how to left hand and right hand searches while blindfolded. The other participants being the obstacles. I was planning on going to Vegas, on the bike. Sorry no one has stepped up to the plate. I was looking forward with excitement to the 2013 Conference. I was to give the Invocation at the formal (full uniform or coat/tie business attire) opening ceremony, the Benediction at the grand closing banquet, and a workshop on LEO and LGBT health during the professional development portion of the Conference. It would have been my third time and I have been SO PROUD to participate by doing what I can in a professional way. Plus, to me, the Annual Conferences have been FUN. When I look at the gay community in general, I am disappointed in the number of times I see events that are excuses for Animal-House-style wild weekends, LOTS of drinking and debauchery... and attended by hundreds! Yet, getting active organizational participants for the Annual Conference is about as easy as getting volunteers for a terminal medical experiment. I'm not a prude by any means but I also derive a lot of joy out of fun professional events too. I'm just sorry that George was not able to find enough professionals to staff (and participate) in committees needed for organizing this Conference. I honor Carroll so much but he has carried almost the entire load for years. It's time for others to step up! Ah, well, let us see how Toronto shines in 2014. And, recalling the AWESOME group from Amsterdam at the Conference two years ago, 2015 will be a home run! I know I stand ready to contribute in my area of training, should they ask. Plus, having been to Amsterdam both in my youth and after my hormones went south , it is an amazing experience! Take vitamins! This situation just underscores, without a doubt, the amount of work that Carroll has done over the years in planning these conferences. It's a shame that with all of the people involved, from all over the country, that this couldn't get done. And I agree with Bear about the social events and debauchery, drinking and all the rest. The few conferences I've attended have had all that. So much so that in some cases some of the lectures and presentations were not well attended at all. And I know Carroll remembers the time he was presenting and had to stop his lecture and wake someone up! He was steamed. I remember in Providence in 2007, there would be a crowd of about 40 or so attendees walking a few blocks to the bar at night. I couldn't help thinking, where were they during the day while the lectures and classes were happening. Some classes were fairly well attended but some were pitifully lacking in attendance. And make no mistake.....(and I'll single out the LA County Sheriff's Department)....some were sent by their department with supervisors along, so they HAD to attend certain classes. The initial conference in 1994 was focused, professional and well attended for the right reasons. I'm sure some of the ones that followed were as well. But somewhere along the line, what Bear has described seemed to overshadow the main reason for attending. I'm not a prude either although I'm not a total party animal either. But Bear's point is well taken. Let's hope whatever conferences happen in the future are well planned with more participation from the groups involved. We'll see.